Friday was a busy day! In the morning Lee and I, together with our guests Cynthia and her daughter Orli, released the two Red-shouldered Hawks, Goalie and Cinnamon. 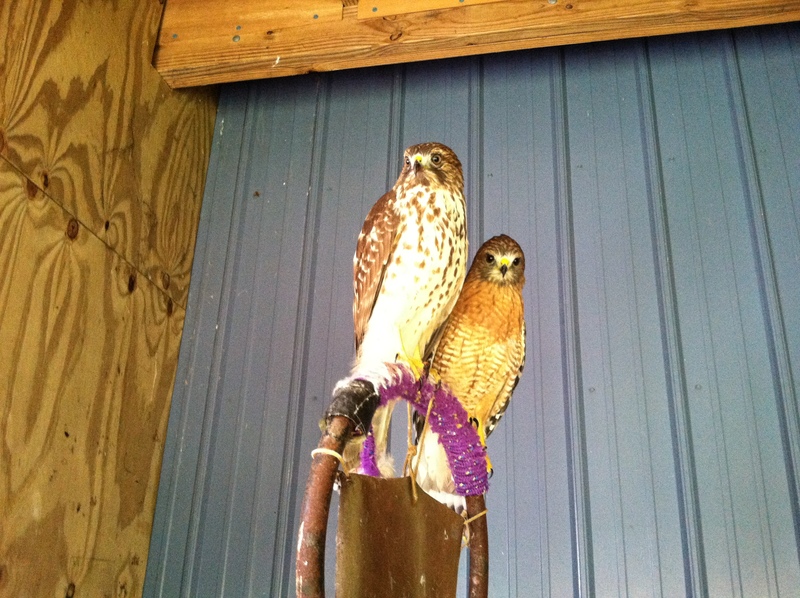 Both hawks were returned to where they were found. Goalie, the adult, went first. We found a nice stretch of woodland next to a creek and pond behind Richard Montgomery High School in Rockville, MD. Lee opened the box while I took the video shown below on my phone. Goalie wasted no time in getting through the trees and out of site. We caught another quick glimpse of him as we headed back to our cars, and then he was gone. Cinnamon was released in the neighborhood in Chevy Chase, MD where he was found. John and his wife Joyanna were there, along with several of their neighbors who participated in Cinnamon’s rescue, including Kathy and Steve. I took Cinnamon out of the box so I could remove a protective “wrist bumper” from his wing prior to release. That gave everyone a close-up view of this beautiful juvenile hawk. Then it was time to send him on his way. Cinnamon didn’t linger. He soared high up to a tree limb in the parkland that backs up to the homes. He surveyed his surroundings briefly, then flew out of sight. This video shows Cinnamon flying on the creance line. I could tell from his strong flight that he was ready to go. Pumpkin. Photograph by Suzanne Shoemaker. After I returned home Friday afternoon, I received a visit from Sarah Milbourne. Sarah manages the Scales and Tails Program for MD Department of Natural Resources (DNR). Scales and Tails is an educational outreach program that uses live birds to teach the public about raptors and their place in the ecosystem. 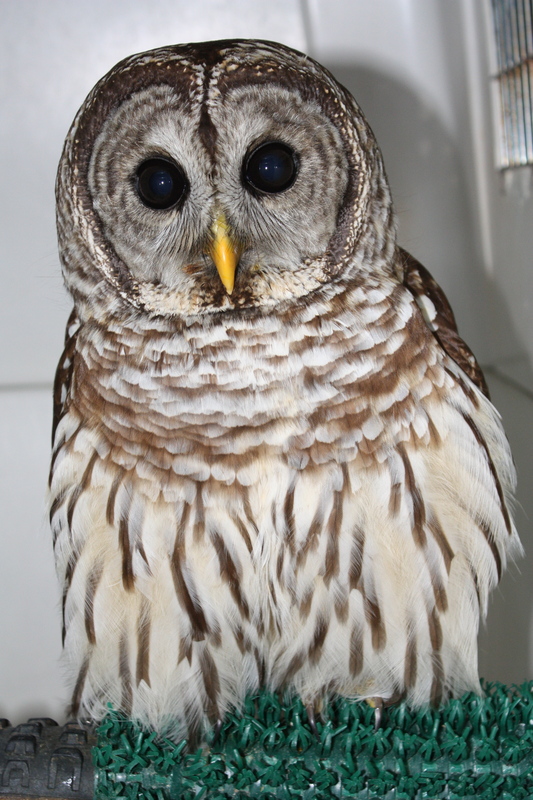 DNR had rescued a juvenile male Barred Owl from entanglement in fishing line at Deep Creek Lake in western Maryland. Fortunately, the owl had not been injured, but the monofiliment line had damaged many of his feathers. Sarah wanted to learn how to repair the owl’s damaged feathers using a technique called “imping”. Imping involves trimming back the damaged feathers and replacing them by inserting a pin between the shaft of the original feather and that of a replacement feather. We began the imping process on Pumpkin, named in celebration of the season, but it will require more than one sitting to repair all his damaged feathers. Pumpkin will reside at Owl Moon until Sarah and I finish imping. When we are sure Pumpkin’s feathers are healthy, he will return to his home at Deep Creek Lake. Beastie Boy. Photograph by Liz Falvo. Much has happened since our last update. Fortunately, much of the news is happy, but there is sad news to report as well. Beastie Boy, the Red-tailed hawk with a fractured hallux (opposing toe) and lacerated shoulder, returned to Second Chance Wildlife Center on September 30th for follow-up x-rays and examination by Dr. Patrice Klein. It was found that the fractured hallux was poorly aligned and has developed a thick callus. The result is that Beastie Boy has lost a functional joint in that toe, which is important for capturing live-prey. There is hope that, as the bone remodels, some function may return. It is also possible that Beastie Boy will be capable of hunting live prey even with the damaged toe. If that happens, he will be returned to the wild. With this hope in mind, Beastie Boy was transferred to a Deron Meador, a falconer, for reconditioning and live-prey testing. If Beastie Boy cannot hunt well enough for release, we will find a good home for him as an education bird. 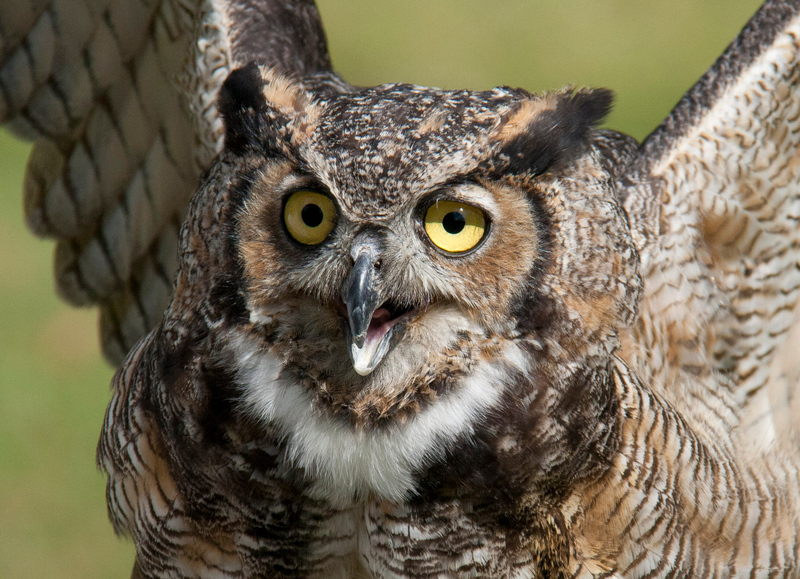 Elmo, the Great Horned Owl with severe tremors (likely caused by West Nile Virus), did not improve. We treated him for ten days with non-steroidal anti-inflammatory drugs (NSAID). If you saw the video, you will understand we could not let Elmo continue to suffer with these tremors. We made the decision to euthanize him on September 27th. Bob. Photograph by Suzanne Shoemaker. Now for the happy news! As of the last update, three birds were being reconditioned for release: Bob, an adult Red-shouldered Hawk; Crooked Beak, a juvenile Red-shouldered Hawk; and Little Bear, a juvenile Barred Owl. I am pleased to report that all three are now flying free. Bob was the first to go. He was returned to his home turf (or should I say “home air”?) in a suburban neighborhood in Gaithersburg, MD on October 6th. After making a brief stop on a nearby tree to look around, Bob took off through the next row of trees and quickly disappeared. Crooked Beak just after her release. Photograph by Suzanne Shoemaker. Crooked Beak and Little Bear were released on the same day, October 10th. Crooked Beak was a nestling when she came to us, and therefore had never flown free. We decided to release her here at Owl Moon. She is comfortable enough with me that she might return for handouts if she has difficulty making it on her own. This is a technique called “hacking” or “soft release” and we have used it successfully with other juveniles. Crooked Beak was released at 11 am. She landed first on the roof of the mews. She sat there for several minutes scoping out her surroundings, then took flight again, made a semicircle over the back yard and headed straight over the back field and into the woods on the other side. I still have hope of seeing Crooked Beak come around again, but as far as I know, she has not returned. We hope this means she is hunting well on her own. Little Bear was released at 4 pm, at his home on a Chesapeake Bay tributary in Severna Park, MD. In true Little Bear fashion, he foiled my attempts to photograph his release by flying out of the box and straight into the camera, then over my head and into the trees before I could refocus. I should have known better! Little Bear was always full of mischief and I have confidence that he will outsmart his prey as easily as he outsmarted me. Cleopatra. Photograph by Liz Falvo. Cleopatra was transferred to Tri-State Bird Rescue and Research Center in Newark, Delaware on October 17th, for pre-release conditioning. I wish I could have kept her here and reconditioned her myself, but Owl Moon has only two outdoor mews, and both are currently occupied. It was in Cleopatra’s best interest to seek outdoor space for her with another rehabilitator. TriState is a superb facility with beautiful big mews (fitting for Cleo), and their staff has generously accepted birds from us on many occasions when they have space. We are grateful to TriState for taking Cleo, and know that she is in the best possible hands. We will return to retrieve her when she is ready for release. Zen. Photograph by Suzanne Shoemaker. Back at the ranch, the remaining patients are doing well. Zen has quieted down now that Little Bear is gone and he has a mew to himself. Zen’s outer primary feathers have been growing in for several weeks, but the increased activity with two in the mew caused damage to the developing blood feathers and he lost several. They have now begun to regrow, and we intend to keep him solitary until they are fully grown. Then we can give Zen a fair flight assessment, which we hope will demonstrate that he can be released. Pixie. Photograph by Natasha Lewandrowski. 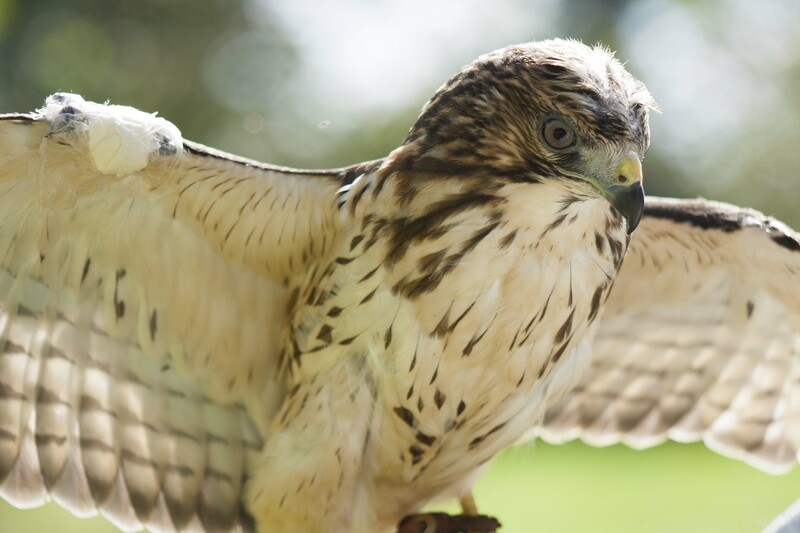 Pixie, the juvenile Broad-winged Hawk, and Plato, the juvenile Cooper’s Hawk, are still in rehab, and both are in line for outdoor mews as soon as they become available. Meanwhile, we exercise them on a creance line most days. They enjoy getting out in the sunshine and spreading their wings. Neither is a sure bet for release, but we continue to treat them with that goal in mind. Summer. Photograph by Suzanne Shoemaker. Summer is showing improvement overall. She (I now think female based on weight) is active and eating well on her own, and most of her CNS symptoms have subsided. However, the visit to Dr. Jennifer Hyman the veterinary ophthalmologist, confirmed that Summer has permanent damage to her right eye. That eye has lost most, if not all, sight. Many rehabilitators would remove Summer as a release candidate based solely on her impaired vision. My own feelings are mixed. I want Summer to survive. I also firmly believe that the best place for a hawk is flying free in the wild. Our plan is to test fly Summer on a creance line. If she flies well, we will look for a falconer to train her and hunt with her. If she proves to her falconer that she can hunt and avoid obstacles with one good eye, then we will give Summer the chance to make it on her own. Cinnamon and Goalie. Photograph by Suzanne Shoemaker. John found the first, on a residential side street in Chevy Chase, MD on October 2nd. We call this juvenile male “Cinnamon” because of his unusual cinnamon-colored plumage. John had observed him standing on the roadside for hours, clearly not normal hawk behavior. He called Owl Moon Raptor Center and we picked Cinnamon up right where John first saw him. We could see some weakness in his left wing when Cinnamon made a half-hearted attempt to escape. Cinnamon later showed us he could indeed fly, but we found an abrasion on the wing near the wrist joint, probably the result of an impact. We cleaned and bandaged the wound and it has since healed completely. Cinnamon has been flown on a creance line for pre-release assessment and conditioning, and while he flies well, there is a slight droop to the injured wing following a workout. We would like to resolve this before we return him to his Chevy Chase home, but we don’t expect that to take long. 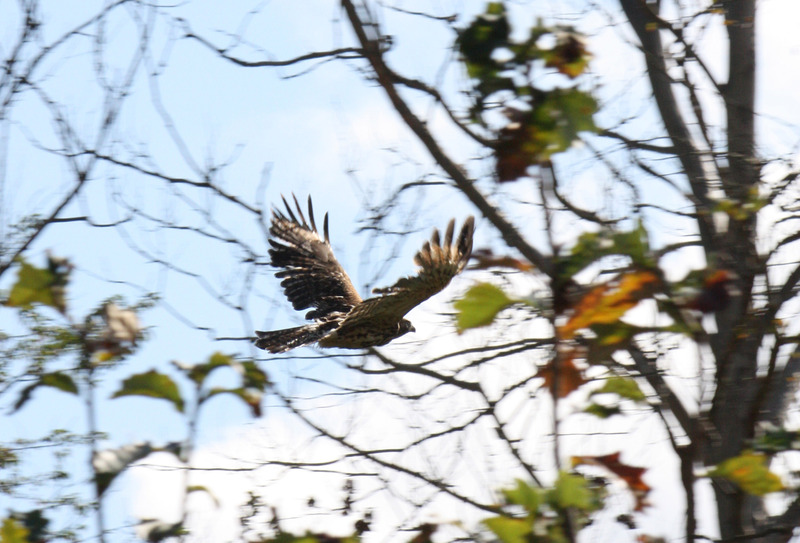 The second hawk was found in Jerry’s neighbor’s garage in Upper Marlboro, MD on October 7th. She had apparently crashed through a window and was found inside, weak and unable to stand. Jerry and his neighbors tried to feed and nurse the hawk for two days before they found Owl Moon. 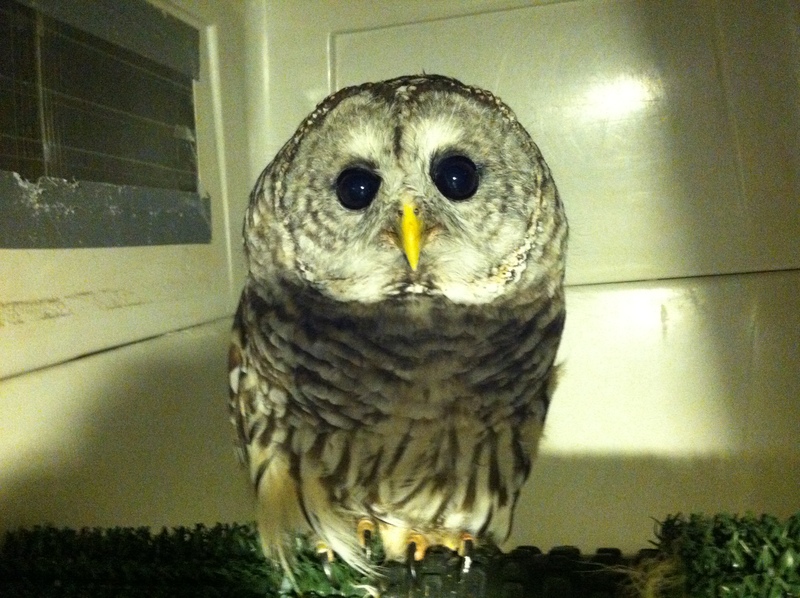 With the help of volunteers Matthew and Mandy, who provided rescue and transport services, she made it to Owl Moon. We treated her with fluids for dehydration, and pain and NSAID drugs for severe spinal trauma. 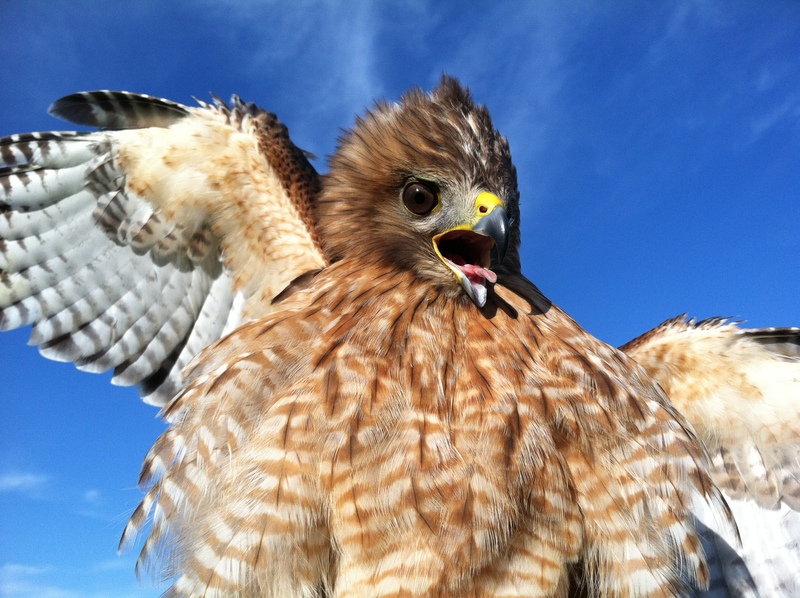 The hawk had respiratory symptoms as well, possibly a result of the trauma. We treated her for this with antibiotics. I took her to Opossum Pike Vet Clinic for x-rays. Dr. Barb could not find a spinal fracture, but her prognosis was guarded. She felt that, if we did not see improvement after four to five days, it was unlikely the hawk would recover from the spinal injury. After ten days there was very little improvement in her legs. She could not stand and her respiration had worsened. We determined that euthanasia was the kindest option. Goalie (named for reasons that will become apparent) was transferred to Owl Moon Raptor Center from Second Chance Wildlife Center on October 21st. He was brought to Second Chance on October 18th, following rescue from entanglement in a soccer net at Richard Montgomery High School in Rockville, MD. The rescuers (who remain anonymous) untangled him from the net and released him, but Goalie did not fly away. Second Chance staff could not find any injuries on intake. They kept him on cage rest until their vet, Dr. Pat Klein, could examine him on October 20th. Dr. Klein found no injuries either, and recommended transfer to Owl Moon for flight-testing. Goalie is now in an outdoor mew with Summer and Cinnamon. 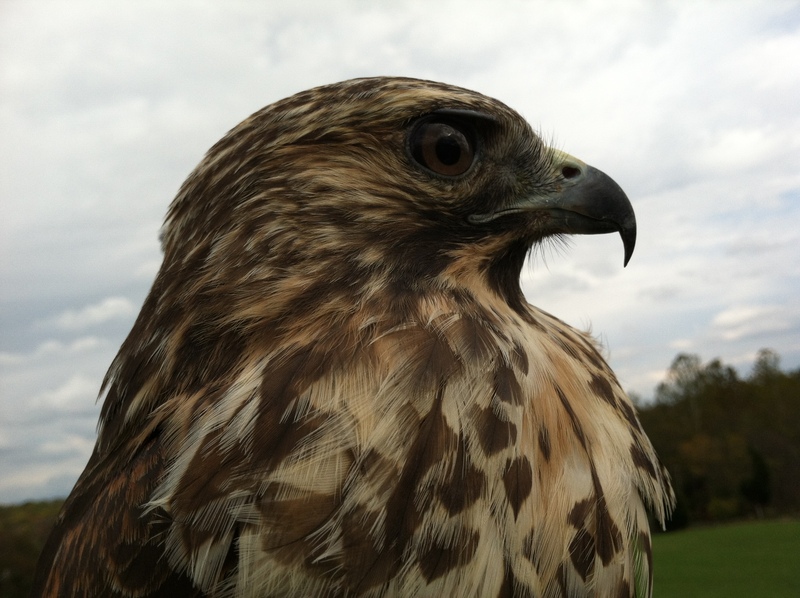 He flies well in the mew, but is relatively calm and quiet for a Red-shouldered Hawk. We will give him a few more days rest and flight test him on a creance line to be sure he is fit for release. Like Cinnamon, we do not expect to keep him long. We hope he can return home later this week.